Canto Ostinato Audio Visual is a performance with harp, electronica and visuals, based on the groundbreaking composition ‘Canto Ostinato’. 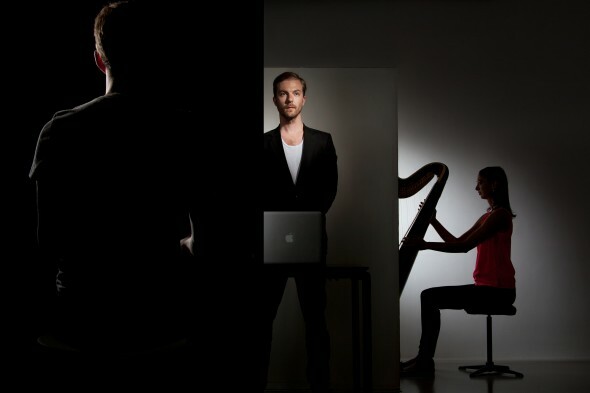 Gwyneth Wentink (harp), Wouter Snoei (electronica) and Arnout Hulskamp (visuals) respond to each other on stage using their instruments and selfdeveloped software, determining who takes the lead according to the codes of ‘Canto Ostinato’. Canto Ostinato Audio Visual takes place on the fascinating intersection between music, visual art and technology, and provides a unique experience for all the senses. Interaction and improvisation are the foundation of the composition; every performance is different. 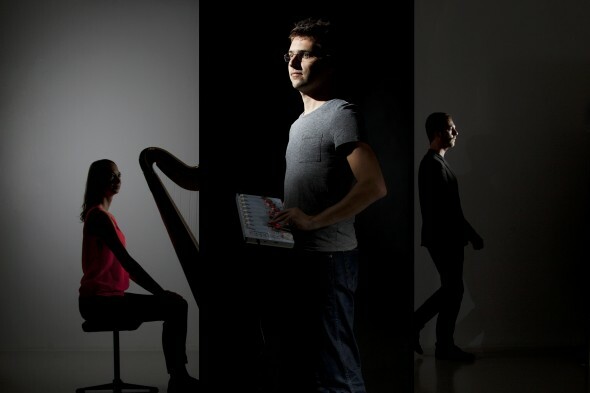 Harp player Gwyneth Wentink, electronica specialist Wouter Snoei and video artist Arnout Hulskamp will bring this arrangement of Canto Ostinato to exceeding stages worldwide. This revolutionary arrangement of Canto is an ode to the famous Dutch composer of minimal music, Simeon ten Holt. Ten Holt died 25th of November 2012, at the age of 89. Canto Ostinato is Simeon ten Holt’s (1923-2012) composition with which he gained national exposure. It is a tonal composition, and therefore marked a new direction in his style of composing. It followed a period in which he developed a language varying from serial music to his own ‘diagonal’ style, all-playing with the concepts of tonality and atonality. His early works embrace experimental, theatrical and electronic elements, followed by compositions characterized by rhythmic patterns, repetitions, and in which tradition and experiment are equally important. 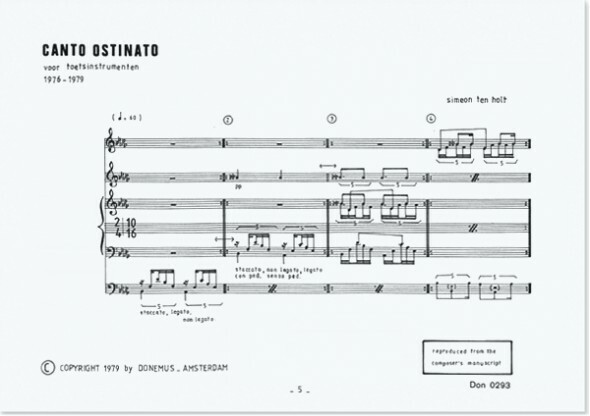 Canto Ostinato is a revolutionary piece that he wrote between 1976 and 1979. The piece consists of 106 cells (loops), which can be repeated according to the performers’ interpretation. Next to the number of repeats, the performer determines the articulations, phrasing, dynamics, and at certain spots, the order in the piece. This makes each performance of Canto Ostinato unique. Improvisation and interaction drive each performance. The performers agree upon signs that indicate who takes the lead, and when they move to the next cell. Because of the tonality, the usage of these cells, and the repetitive nature of the piece, the composition is labeled as minimal music. Canto moves people, and has achieved a worldwide following. Gwyneth Wentink is an internationally acclaimed harp player and winner of, among other awards, the Dutch Music Award – the highest distinction awarded to musicians in The Netherlands – the Israel Harp Competition and the YCA auditions in New York. Surprising choices and groundbreaking projects define Wentink as a first class innovator and have brought her to classical stages such as Carnegie Hall, Wigmore Hall and The Concertgebouw Amsterdam. She performs on a regular basis with Indian and jazz musicians as Pt Hariprasad Chaurasia and George Brooks and holds a position as solo harpist in the orchestra of John E. Gardiner in London. Wouter Snoei graduated as Master in Sonology at the Royal Conservatoire in The Hague. He took his first steps in the music scene as a dance producer, earning him De Grote Prijs van Nederland (Dance) in 1997. As a composer of contemporary electro-acoustic music he worked with ensembles like Calefax Reed Quintet, VocalLAB, Slagwerk Den Haag, and received the Matthijs Vermeulen Incentive Prize for young composers. Snoei is a renowned performer and sound-director of electronic works by composers such as Luigi Nono and Pièrre Boulez. He developed the software of the internationally acclaimed Wave Field Synthesis system of the Game of Life Foundation, a revolutionary system that allows sounds to ‘travel’ through a space in an entirely new way. Arnout Hulskamp (1978) studied at the HKU University of the Arts Utrecht and made a name for himself with his Open Wound software, which enabled him to compose expressionist glitch video. His original work resulted in a residency at TrouwAmsterdam and performances worldwide. With his platform for (interactive) light and video installations, aaiqu (all art is quite useless), he worked for clients like TEDxAmsterdam, the Zuiderzeemuseum and Rabobank. Since 2013 Hulskamp has been collaborating with Christopher Gabriel using the moniker Children of the Light, creating abstract and highly spherical scenographies using decor, light, haze, reflections and animations. Insiders characterized their work as game changing. Hulskamp was twice awarded the Gouden Reiger award.